Goeido, Onosho, Daishomaru ont pris la tête du tournoi d’automne après 1 semaine de combat. A mi-chemin du tournoi, l’Oseki Gôeidô ainsi qu’Onosho et Daishômaru mènent avec 7 victoires pour une seule défaite. 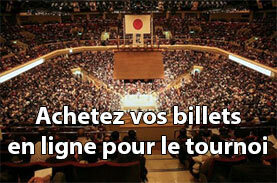 En une trajectoire rectiligne et sans interruption, Gôeidô a reconduit le komusubi Tamawashi hors du dohyo. Encore une victoire, et Gôeidô sera assuré d’être kachi-koshi. Le maegashira n°3 de 20 ans, Onosho (7-1) a tiré Tochinoshin vers le sol ; ce maegashira n°1 ne réussit pas, pour l’instant, son tournoi puisqu’il affiche le score inverse (1-7) d’Onosho. Demain, Onosho rencontrera Chiyotairyû (également maegashira n°3) qu’il n’a pas encore battu lors de ses 2 précédentes rencontres. Un peu plus tôt dans l’après-midi, dans un combat éclair, Daishômaru a canalisé la charge de Takekaze, et reste ainsi dans le groupe de tête. Hier encore parmi les 4 lutteurs affichant le meilleur ratio de victoires/defaites, Daieisho marque le pas en perdant face au maegashira n°14 Okinoumi. Pour son retour au tournoi (suite à blessure), le maegashira bulgare Aoiyama (0-1-7) s’est incliné face au yokozuna Harumafuji lors du dernier combat de la journée. 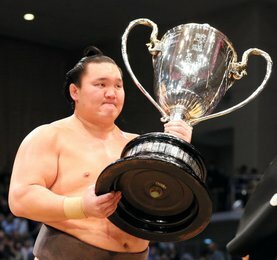 Une mauvaise nouvelle : l’Ozeki Terunofuji, qui s’est retiré du tournoi vendredi avec une blessure au genou gauche, ne reviendra pas et est certain de perdre un rang pour redevenir sekiwake. Son maître, Isegahama, a déclaré qu’il ne pouvait pas encore remarcher. 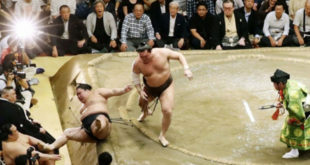 TOKYO (Kyodo) — Ozeki Goeido and rank-and-filers Onosho and Daishomaru each improved his record to 7-1 on Sunday to retain a share of the lead midway through the Autumn Grand Sumo Tournament. Goeido took little time to bulldoze Mongolian komusubi Tamawashi (3-5) out of the dohyo ring at Ryogoku Kokugikan in Tokyo and now needs one more win to secure a winning record at the 15-day meet to remain in sumo’s second-highest rank. Goeido evened his head-to-head against Tamawashi to 6-6. No. 3 maegashira Onosho weathered an attempted throw by top maegashira Tochinoshin (1-7) and pulled the Georgian down by the shoulders onto his hands and knees in their first career meeting. 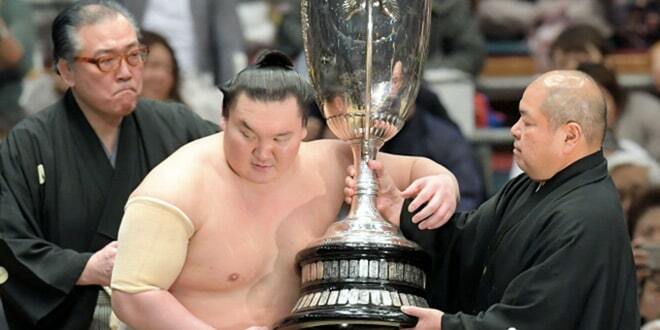 Onosho, who upset yokozuna Harumafuji and ozeki Terunofuji at this tourney, has lost only to Goeido so far. The 20-year-old is set to fight No. 3 maegashira Chiyotairyu, whom he has not yet beaten in two bouts. Earlier, No. 12 maegashira Daishomaru absorbed Takekaze’s charge and slapped the 10th-ranked maegashira down by the back of his head to his sixth loss. The other overnight leader, Daieisho, dropped into a four-way tie at 6-2 after the No. 11 maegashira lost to 14th-ranked Okinoumi (4-4). The three other wrestlers with six wins so far are No. 3 Chiyotairyu, who defeated fifth-ranked Shodai (4-4), and the two No. 9 maegashira, Takanoiwa and Arawashi. In the day’s last bout, Harumafuji (5-3) had little trouble executing an overarm throw against Bulgarian No. 2 maegashira Aoiyama (0-1-7), who competed for the first time at this tournament after sitting out the first week. 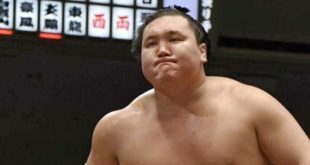 Ozeki Terunofuji, who withdrew from the tourney Friday with a left knee injury, will not be returning and is certain to drop down a rank to sekiwake as he was fighting in a demotion-threatened « kadoban » status for the fifth time and could manage only one win. 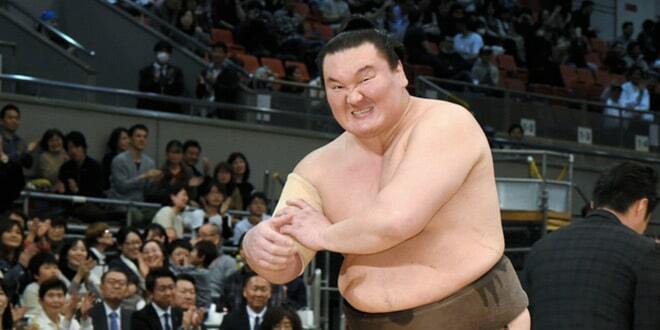 His stablemaster, Isegahama, said the 25-year-old Mongolian, who was promoted to sumo’s second highest rank for the July 2015 Nagoya tourney, cannot walk yet and will set his sights on the next tourney in November, where 10 wins will reinstate him as an ozeki.